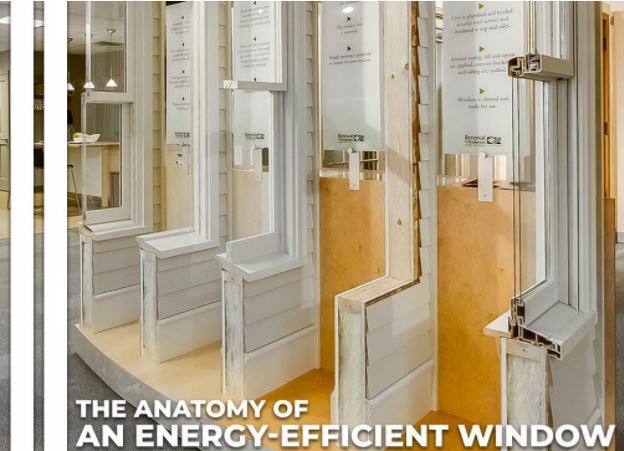 It’s not enough for the framing material of energy-efficient installation windows to be an excellent insulator; it should also be rigid, long-lasting and low-maintenance. For example, a material that expands or contracts in extreme temperatures will make your home vulnerable to leaks. At Renewal by Andersen® of Spokane, our exclusive Fibrex® material is twice as strong as vinyl and, unlike wood, is impervious to moisture. It insulates 700 times better than aluminum and remains stable with extreme changes in temperature. Fibrex does not need scraping or repainting to stay beautiful and sturdy. Dual-pane windows are today’s standard in America. They consist of two panes with optimum distance from one another for maximum energy efficiency. The air space between them may be filled with an insulating gas to further reduce thermal transfer. We use our own argon gas blend in window replacement to provide excellent performance at an affordable cost. Virtually invisible Low-E (low-emissivity) coatings are applied to the inner surface of the exterior glass to filter out the undesirable portions of the solar spectrum. The most advanced Low-E option on the market is the spectrally selective kind. Deflecting harmful wavelengths while admitting desirable ones, spectrally selecting Low-E glass offers the best trade-off among solar heat reflectivity, UV protection and daylighting. Our Low-E4® SmartSun™ glass option is layered with 11 microscopic, spectrally selective coatings to block 72% of heat and 95% UV radiation passing through it. In addition, it admits 65% of sunshine and has virtually no effect on the light’s color and clarity. The spacer keeps the two panes sturdily in place. An aluminum spacer system can do this job, but it’s not energy efficient because it conducts a lot of heat. While stainless steel is metal, it’s considered warm-edge because it delivers better thermal performance than aluminum. At Renewal by Andersen of Spokane, we chose stainless steel because it’s far stronger than most materials available. We’re able to make a thinner and less conductive spacer wall, making our casement, double-hung, bay, bow, picture, sliding and specialty windows more energy efficient. Learn about the ratings of our windows to find out whether they meet the ENERGY STAR requirements in your area. Call us at (509) 202-4090 today to schedule your free, in-home consultation in Spokane or any nearby cities, and let’s talk about your needs. "Excellent experience. Adam & Ryan were our installers,they are the reason for our rating. Both worked very hard with great results for us. They were very respectful to our home and furnishings. Leaving our home clean at the end of the day. The look of the new windows and sliding doors really updates our home. Adam & Ryan were with us for a full week, it was a pleasure to have them in our home. A big THANK YOU to both of them. We are very pleased with our new windows."